Kids will enjoy the benefits of breathable waders. These waders are made of the same fabric and they have many of the same features as our Lightweight waders. They have built-in side straps, eliminating the need for a wader belt. 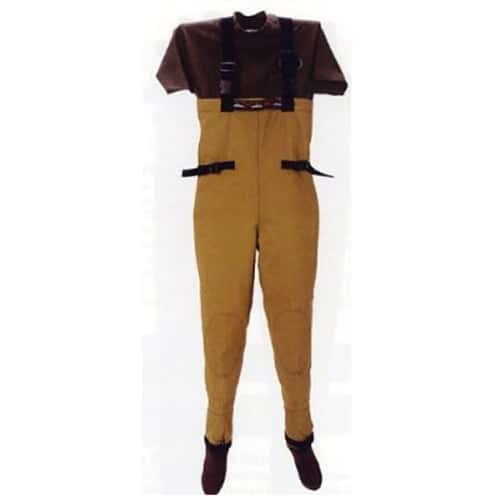 Suspenders are removable and feature opposite end clasps that allow a quick conversion to a waist high wader. There is a double layer of fabric at the knees, and no inside leg seam. The feet are built from 3mm neoprene and have a hypalon bottom for added durability. There is an inside pouch for keeping small items handy and the nylon webbing on the chest can be used to attach accessories such as clippers and hemostats. All seams are taped. NOTE: When using the size charts, if you fall between sizes, always go with the larger size.